iOS equivalent of Solid Explorer FTP? As a long time Android phone user I am used to the convenience of Solid Explorer and its FTP capability coupled with Directory Opus for transferring files between phone and (Windows) PC. Can any of the DOpus users on this forum point me in the direction of a comparable utility for doing the same with an iPhone? There are apps with FTP server support on (non-jailbroken) iOS, but paths they can FTP-serve are limited to their app sandbox (can't serve system wide paths as on Android). 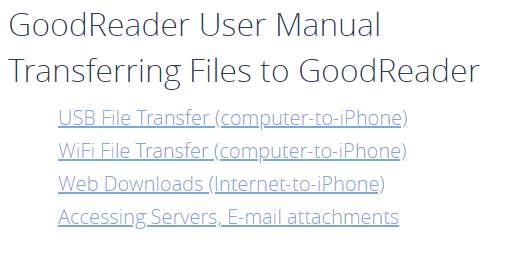 Off the top of my head I can recommend the GoodReader -- I didn't really find a better alternative to Solid Explorer on iOS, even though the GoodReader is a document reader (and more) but it has so rich functionality for file management that it's like a Directory Opus for iOS basically. And yes, it has a FTP server functionality (either direct connection with e.g., Opus, or via local web interface via your webbrowser). Also a GoodReaderUSB is available which is a small utility for quickly transferring files from/to it via USB. Thanks @bytespiller. I have read good things about GoodReader elsewhere. I'll give it a go when I have a bit of spare time. If it's anything like as powerful and feature rich as Opus I will need plenty of time! Thanks for checking @oscillik, you're right! I've misremembered the GoodReader's (local) wireless file transfer capabilities, they're indeed one way only, and no FTP server capability. FWIW GoodReaderUSB utility is two way (files can be copied to PC by drag & drop, I've just checked on my device).